Dawes struck 19 minutes from time to ensure Worthing came from a goal behind to seal 2-1 first-round win at two-divisions higher National League outfit Dagenham & Redbridge on Saturday. Worthing served up a near faultless display but were made to do it the hard way to seal a spot in round two. Paul Benson’s strike five minutes before the break put Daggers ahead but a second half own-goal from Josh Staunton and Dawes’ effort helped Worthing secure £5,000 in prize money. Looking back on the memorable victory, Dawes said: “It’s probably the best feeling I’ve ever had, it was a little bit emotional but it was incredible. “At 1-1 I was thinking let’s get this back to Woodside, but then getting the winner, we didn’t even need to worry about that. “It was a massive result for us, especially coming back from a goal down and it gave everyone a quality feeling. “I thought we battered them second half, the first 45 minutes were quite even, we just kept calm and carried on going to get the right result in the end. As well as Worthing’s two goals, Omar Bugiel saw a first half strike come back out of a post, while Dawes’ late effort was well saved by Daggers goalkeeper Mark Cousins late on. With two-leagues separating the teams and Daggers a Football League team last season, Dawes was a little surprised by Dagenham on the day. The draw for the second round of this year’s competition was made yesterday with Worthing handed a home tie against National League outfit Sutton United. 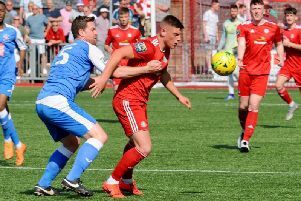 Sutton were promoted as National League South champions last term and Worthing joint-boss Gary Elphick is expecting a tough test. He said: “They’ve taken a few by surprise this season and having a 3G pitch aswell, they won’t be too daunted at coming down. The tie is due to take place at Woodside Road on Saturday, January 14.